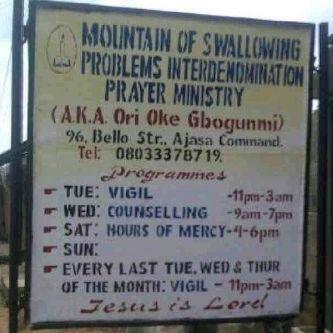 There is no end to the outrageous names people give their churches in Nigeria these days. For instance; High Tension Ministry, Devil go hear am Jesus Ministry, Chukwudi & Son evangelical ministry, Aba, Holy Ghost on Fire Ministry, Abuja, Jesus the Landlord, We the Relaxing Pew ministry, Port-Harcourt… please someone stop me. It goes on and this has just been added to the list. PS: Notice nothing happens on Sunday, we are not surprised!